A powerful movement toward sustainable new construction and renovation has homebuilders, contractors and homeowners buying in, lured by environmental concerns and a desire to cut utility bills. Peter Michelson has been walking the green line for about 30 years, since he was a kid in Boston going door-to-door for Greenpeace, campaigning to stop the bludgeoning of baby seals in Canada. He’s a fourth-generation contractor, an environmentalist with a wide-angled perspective. If there is an upside to global warming, Michelson and others involved in the budding green-building movement have found it. And it’s not just the bottom line, but in the consciousness of the population. And that what we build and how we rebuild it matters. There is 300 billion square feet of built environment in the United States, with 5 billion square feet of new space added every year and 5 billion square feet of existing space being renovated. These buildings consume 76 percent of the nation’s electricity and are responsible for about half of the greenhouse gas emissions. All of this dismal data has inspired a national movement toward green, sustainable building as local governments adopt codes that incorporate green building principles and practices into the design, construction and operation of their facilities. The United States Green Building Council’s LEED certification program (for Leadership in Energy and Environmental Design) has captured the attention of commercial developers, and the concept of environmentally and socially conscious building is hitting home and gaining momentum in Georgia and across the country, as green home building and remodeling continues to progress into the mainstream. For proponents and practitioners, green building is a matter of planetary survival, the only alternative to building ourselves into oblivion. The residential sector alone accounts for 22 percent of the nation’s total energy use, 74 percent of water use and about 21 percent of the carbon dioxide emissions. “To build green means you’re being responsible,” says Jeff Cole, creator of Atlanta-based myEnergyLoan, a national green-lending program that provides closing cost discounts and low interest rates for buyers of energy-efficient homes and home renovations. “To build green means that you’ve considered your impact. Given everything that we know, and when you think about the actual impact that housing makes, to build any other way is lazy and irresponsible. It means that you’re highly disruptive to the Earth and the ecological systems that are in place and functioning well. With the nation in the grips of an historic sub-prime mortgage housing crisis, green apostles such as Cole are touting green building and renovating as an obvious long-term solution. “The sub-prime mortgage market allowed people to get into homes that they couldn’t afford, and it’s not just that mortgage payments are high. An inefficient home is expensive to operate, it’s just that simple,” Cole says. Meanwhile, homes that strive for, or achieve green LEED, EnergyStar or EarthCraft standards drastically cut their utility bills. Those savings, and growing concerns about the health of their families and their planet, are inspiring homeowners and buyers to go green in greater numbers. The market for green homes, currently about $2 billion nationwide, is expected to climb to $20 billion within five years, according to a report by the National Association of Home Builders (NAHB), and homeowners are now using green products for 40 percent of their remodeling and renovation work. “It’s a shame to invest money in renovating your house and not do it the right way, and if you don’t have energy efficiency as part of the plan, you’re not doing it right,” says Sydney Roberts, home services program manager for Southface Energy Institute. The 30-year-old Atlanta-based institute teaches homeowners and builders how to build and sustain green, resource-efficient homes through an array of courses and training, and offers technical assistance for residential construction and remodeling projects. Southface’s flagship program, EarthCraft House, run in partnership with the Greater Atlanta Home Builders Association, is a blueprint for energy-efficient homes. Since the program was launched in 1999, more than 4,000 single-family homes and 1,500 multi-family dwelling units in six Southeastern states have achieved EarthCraft certification, which means they are better insulated, use energy-efficient appliances, have better indoor quality and an overall tighter building envelope. When Decatur residents K.C. Boyce and Michelle Frost wanted to expand their living space, they found Michelson. The couple had been living for the past five years in a 950 square-foot, two-bedroom, one bath bungalow built in 1938. They looked at other houses before committing to a wholesale green renovation. What they’ll end up with is a 2,200 square-foot Prairie style home that fits seamlessly into their neighborhood. “We didn’t want to stick out like a sore thumb,” Boyce says. The house’s green features include a geothermal heating and cooling system, gravity-fed rain harvesting cisterns that can handle up to 800 gallons of nonpotable water, bamboo flooring, countertops made from recycled glass and concrete, high efficiency windows, doors and appliances. They’re reusing almost all of the original foundation, exterior walls and front flooring. And Michelson says he’s using wood taken from the old house as part of the new structure, or mulching it on the property. The project will be featured on the Discovery Network’s Renovation Nation TV show later this year, and the couple is chronicling everything on a blog (www.601third.com). If most of the existing housing in Georgia and the United States was built before the green revolution, and the average house is responsible for more air pollution than the average car, it stands to reason that green renovations and remodeling present the quickest way to reduce building-related greenhouse gases. A number of Georgia contractors in the remodeling sector, like Michelson, work entirely in shades of green. Many have completed the Southface/EarthCraft House renovation program. Atlanta’s Carl Seville helped invent the program. 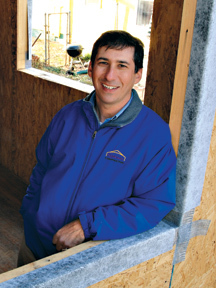 Seville became committed to sustainable development during his 25-plus years with SawHorse, Inc., the remodeling firm he founded. Several years ago he started his own firm, Seville Consulting, providing services to architects, contractors and homeowners. “When I look at how much green building and remodeling have advanced the past few years, I feel confident that I’ve had some impact, that I’ve done a better job for the environment as a whole doing what I’m doing now,” says Seville, who has won a house full of awards over the past four years, including the 2007 Green Remodeling Advocate of the Year honor from the NAHB. To Seville, green remodeling means treating the house as a system, each one as a unique living organism. One size does not fit all. The NAHB points out that standard homes are becoming increasingly green, with homeowners using green products for 40 percent of their remodeling work; but Seville says that tuning up minor details, like caulking cracks and improving attic insulation, can have a major impact for homeowners with a modest budget. “If we could make every existing house in the country 10 percent more efficient, that would save more energy than if every new house was a zero energy house,” he says. “And it’s so easy to make a house 10 percent more efficient. Like Seville, Martin Melaver believes sustainability is as much, or more, about sociology than construction. “Most of what you hear about sustainability focuses on materials, technology, bricks and mortar,” says Melaver, whose Savannah-based Melaver, Inc., a third-generation family business, has eight LEED certified projects in its portfolio. The real estate development firm made history in 2006 with completion of the nation’s first LEED certified retail shopping center, Abercorn Common (which has the first LEED McDonald’s) in Savannah. Melaver, co-developer of Atlanta’s first LEED multi-family housing project (Oakland Park), is developing Sustainable Fellwood in Savannah on the site of the city’s first public housing project. The $50 million project is being built for the Housing Authority of Savannah. Upon completion it will include 220 public/affordable housing units, 100 senior housing units, 10 single-family homes – all energy efficient, with water conservation features. Plans include an organic community garden, park space, a community health clinic, library, business incubator, retail and office space on the 27-acre site just west of the historic district. Fellwood is striving for LEED and EarthCraft community standards. That sense of invigoration is flowing throughout the green affordable housing grid for a number of reasons, says Gray Kelly, director of sustainable development for Southface. “There’s really a confluence of great efforts directed toward the greening of affordable housing. Here in Georgia and Atlanta, the money is available,” says Kelly, who credits private foundations, like the Home Depot Foundation, for aiming much of its largesse at energy-efficient affordable housing, which inspires a buy-in from developers. That includes Sustainable Fellwood. Melaver is receiving $8 million in tax credits, which can be sold to finance the development. It could have been a scene from Brooklyn, but it was a typical early evening in Glenwood Park. Typical except for the man with the microphone. Three years ago Speakman and his wife Amy Macklin (who works for Atlanta Habitat for Humanity) were among the first new residents of Glenwood, an energy-efficient, water-saving EarthCraft House community and mixed-use neighborhood two miles east of downtown Atlanta that was developed by Green Street Properties, the firm started by Mindspring founder Charles Brewer. The $150 million development will ultimately have 99 detached single-family home lots, 91 attached townhouses, 138 condo units, 20,000 square feet of office space, 50,000 feet of retail space, a public park and public town squares. The neighborhood already has a lived-in look, by design. And it’s setting standards for green communities. Glenwood is a 28-acre brownfield re-development in an urban infill location – an old concrete recycling facility. In fact, Green Street recycled 259 million pounds of concrete as part of the project, and 800,000 pounds of granite and 30 million pounds of wood chips that were converted into electricity at an Alabama power plant. Glenwood will harvest about 35,000 gallons of water per week and save at least 1.3 megawatts of energy per year – enough to run another 81 households for a year, or roughly the equivalent of removing 243 cars’ worth of air pollution every year. Speakman and Macklin live in a home that is 25 percent larger than the house they left in nearby Ormewood Park, but they’re using 30 percent less energy. Their water bill is only $20 a month. The green initiatives brought them, urban colonists of an evocative urban community, where stormwater and condensation slake the flowers, and neighbors gather easily with reporters on new city sidewalks. As if natural human spontaneity wasn’t possible in a premeditated neighborhood.